When asked to design a garden for Norwich cathedral I imagined something in the surrounding landscape, but found that it was actually to be in the new ‘Hostry’ or welcoming hall for visitors to the cathedral. Inside this beautiful modern building is an exhibition area at the end of which, behind a glass screen was a ‘dead’ space, not accessible by the public and yet on full view through the glass. This was the location for the proposed garden. The idea for a Japanese garden came from one of the Canons at the cathedral, who wanted akaresansui garden in this space at the very entrance to the cathedral. 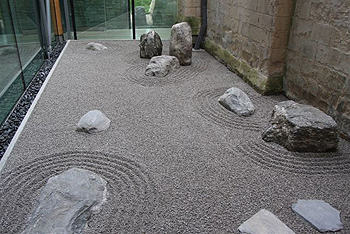 He contacted the Sainsbury Institute for the Study of Japanese Arts and Cultures whose offices are inside the Cathedral Close in Norwich, to ask if they knew anyone who might be able to design and build such a garden. Simon Kaner, the Head of Centre for Archaeology and Heritage at the Institute, contacted me to see if it was something the Japanese Garden Society could take on. As a Society promoting Japanese gardens in the UK, we needed to be sure that the space was suitable for such a garden and that ongoing maintenance would be properly done, something that is often overlooked in the excitement of creating a new garden. Another issue for us was whether we could, using our voluntary effort, construct a garden that was worthy of such a prestigious location. The requirements were simply that the garden should be just boulders and gravel, with a few stepping stones at one end for access to service cupboards. Specifically there were to be no plants in the garden, which simplified matters and meant that maintenance would be much easier. Given our experience of building several other gardens in public spaces I felt we had the design and construction experience and technical expertise required. The Sainsbury Institute agreed to raise money from donations to pay for the materials for the garden and the Japanese Garden Society agreed to donate the labour and equipment needed. In early 2010 Robert Ketchell and I produced two slightly different designs for consideration by the Sainsbury Institute and the Canon at the cathedral. 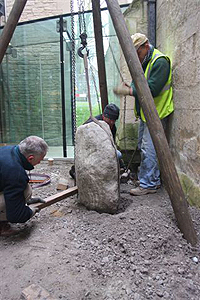 At this stage there were two important provisos; firstly that there was nothing under the existing surface that would prevent us placing boulders where we wanted them; and secondly that we could transport the boulders into the space through the new Hostry building. When the answers to these concerns came they were not what we’d hoped for. Just below the surface of the space is a huge waste water pipe about 2 ft in diameter running right down the centre and under no circumstances was a heavy weight to be placed over this. This rather compromised the chosen design which needed heavy boulders to be placed over that line. 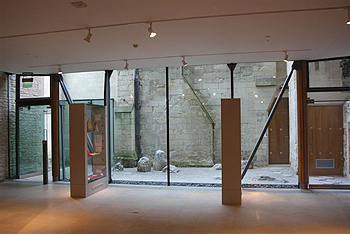 Then we heard that the architect and builders of the Hostry were both very reluctant to grant permission for us to wheel boulders over the new polished stone floor, which has under-floor heating pipes. With a few days to go before construction we were asked to access the space through an alternative doorway, which at only just over 60cm wide was very narrow and with slightly skewed access. Our stone trolley is exactly 60 cm wide, so we could just squeeze through. However I knew that the large rocks we had selected from the stone yard were likely to be much too wide. I asked the yard to remove anything wider than 60cm and provide smaller replacements. Our double challenge now was to build an arrangement with smaller boulders than originally envisaged and to avoid placing them over the underground pipework. We reverted to the second of our designs which was spatially more suited to the restrictions on stone placement. We successfully negotiated the narrow doorway (after removing the door) with only a couple of millimetres to spare with two of the rocks. Robert Ketchell set about placing the main boulders so that we avoided all the danger points with underground pipes. The team of people involved consisted of 8 volunteer members of the JGS including Robert Ketchell and myself as designers. The garden was completed in just two days. The materials used were Scottish glacial boulders (9 in total), 6mm silver-grey granite gravel (2½ tons), sawn carboniferous sandstone edging, polished black pebbles and black quartzite as stepping stones. 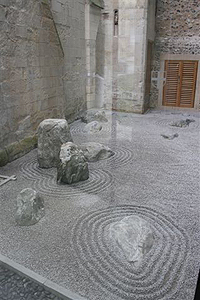 The stone arrangement features a triad as the focal point, which can be interpreted as a Buddhist triad or the Christian Trinity, given the situation of the garden. The remaining stones are arranged as if they are all pointing to or leading to, or perhaps being drawn towards the triad. Hopefully viewers of the garden may feel that they too are joining these in being drawn towards the triad. At an aesthetic level, we feel the garden provides an interesting and appealing landscape vista at the end of the exhibition space. We hope that visitors will pause for a moment on their way into the cathedral to engage with the garden and hopefully we will have contributed to the whole experience of their visit. The name we gave to the garden (courtesy of Robert Ketchell) is ‘Tokuon no niwa’ or ‘Garden of Calm Virtue’.